Ashwood Carpentry and Joinery Ltd offers a design and planning service, for kitchens, bathrooms, bedrooms and studies, which is backed up with a complete project managed installation service if required. Arrange a free, no obligation, design consultation. We will arrange to measure up for you and listen closely to your ideas and requirements for your new kitchen, bathroom, bedroom or study. We can then work on plans incorporating your ideas plus any suggestions we may have. We use the latest computer aided design technology to create accurate and realistic designs. Once the designs are complete we will arrange a home visit go over the plans and design. We can move things around to get your perfect kitchen that works perfectly for you. Once you're happy with the designs we will talk through appliances, worktops, sink, tap and handles and any internal storage requirements. Ashwood Carpentry and Joinery Ltd can provide kitchens of all styles and budgets. The installation of a kitchen, bathroom, bedroom or study can involve several different trades. Kitchen and bathroom projects may require work to be carried out by a multitude of trades including carpenters, plumbers, plasterers, electricians and tilers. Trying to organise these trades to work in conjunction with each other seamlessly can be quite a challenge. That is why, we at Ashwood Carpentry and Joinery Ltd offer a full installation and project management service that oversees all aspects of your installation. 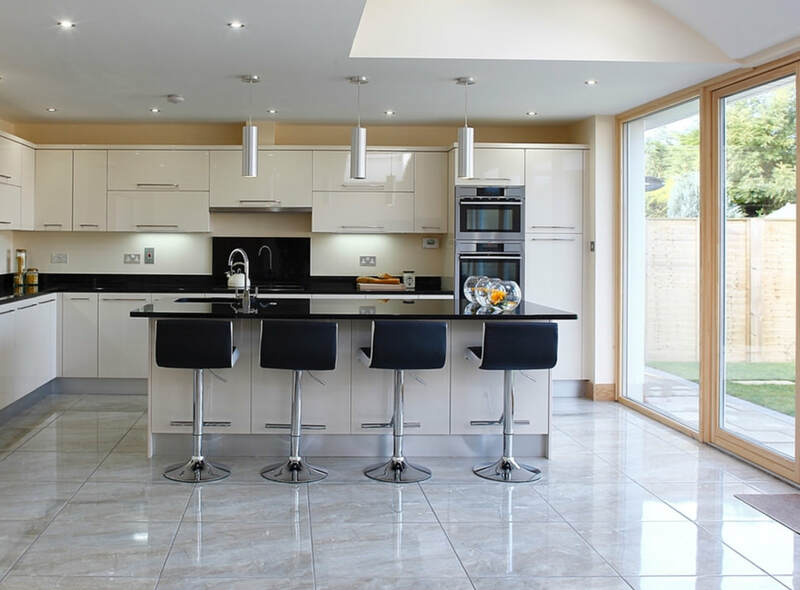 The kitchen is considered to be the central part to the home be it a working or entertaining environment, at Ashwood Carpentry and Joinery Ltd we believe it is important to provide a kitchen to suit your lifestyle. We supply Crown Imperial Kitchens. For a free Crown brochure, click on the link. You can also take a 360° tour to view the ranges. With links to features and technical information, you will see why Crown is a popular choice with many of our customers. Crown Imperial furniture has been manufacturing for over 70 years and is British Built. We offer an installation-only service to customers who have purchased kitchens from other manufacturers. A kitchen is naked without its appliances. In fact, when planning the design of your kitchen, large appliances such as the refrigerator, cooker and dish washer form the key components around which everything else is placed. In the modern age there are an ever-increasing variety of electrical appliances and accessories that need to be considered when choosing a new kitchen. Then there are the accessories such as the taps, lighting fixtures, handles, pull-outs, hoods, and backsplashes. These both enhance the look of the kitchen and add much needed functional elements. At Ashwood Carpentry and Joinery Ltd, we offer a wide and varied range of appliances and accessories to perfectly match with your individual needs, requirements and the format of your fitted kitchen. Whether you’re deciding between a premium free-standing fridge to act as the centrepiece of your kitchen or a hidden built-in fridge camouflaged as a standard cupboard, we can help you choose and then incorporate it into the final design. Whatever large kitchen appliances you can think of, we can supply, including wine coolers, washing machines and microwaves. We can supply you with a full-colour brochure together with our expert advice. ​While the bathroom may not rival the kitchen for being the social hub of your home, it is no less important a room for creating a happy home life. No matter the size of your home or your personal taste and style, Ashwood Carpentry and Joinery Ltd are here to provide you with a bathroom fitting service that ensures you can enjoy your bathroom for many years to come. In order to make your life as easy as possible, we can completely transfer your bathroom for you by doing everything from initial design through to the installation of your new bathroom. We specialise in the supply and fitting of bathroom suites and wet rooms. Whether you need a complete bathroom refurbishment, new shower or simply a replacement toilet, from design to installation. ​Our carpentry and joinery service encapsulate all the aspects of general woodwork. From timber renovation to repair work, we do it all. Ashwood Carpentry and Joinery Ltd has earned a reputation for providing unique designs and creating high-quality bespoke products across the commercial and domestic sectors. Ashwood Carpentry and Joinery Ltd specialise in commercial property including shops, offices and schools.